First you have to determine what kind of object it is: static or animating. You can add collision to static objects using STRpix. 1. Open STRpix and load your wad. 2. On the upper left of the screen you will see the textures and right below that is the Boundary Data window. 3. 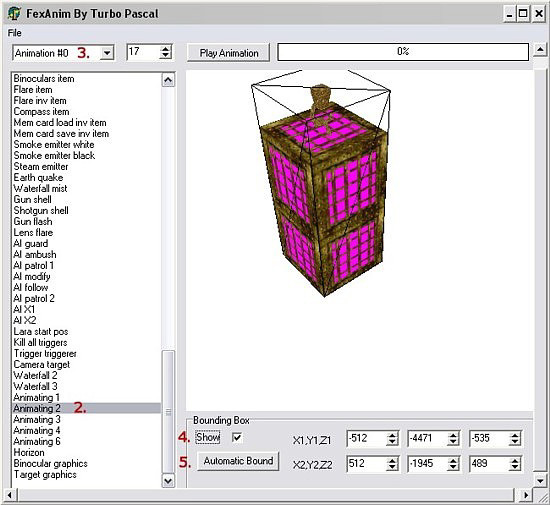 Select a static object in the static meshes box. The object will appear on the right of the screen. 4. Check Show Box. A yellow wire frame appears around the object. 5. Usually the Visibility Box and the Collision Box have the same size, but they can be different. I sometimes create a smaller collision box for plants. To adjust the collision check Collision box. You can now either adjust the coordinates in the boxes or simply click Automatic Bound. 6. Save the wad and check out the new collision! You can add collision to animating objects using either Fexanim or WADMerger. NOTE: Objects placed in the animating15 and animating16 slots can't have collision. This is an hardcoded thing and cannot be adjusted using one of these programs. 1. Open Fexanim and load the TR4 (Fexanim doesn't work with wad files) which has the animating object that needs a new collision box. 2. Select the object from the list. 3. Select the animation that needs adjusting. next to this box is the frame list. Make sure it is set to 0 or higher. You can't adjust collision when the animation is set to frame -1. 4. Check Show Box. A black wireframe will appear around the object. 5. Manually adjust the collision coordinates or click the Automatic Bound button. 6. Save the TR4 file. 7. Use Trupdate to transfer the new collision data back into your wad. 2. 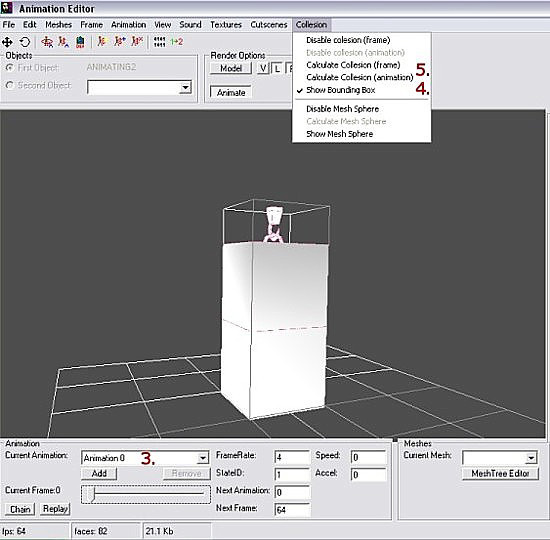 Select the animating object that needs adjusting and open Animation Editor. 4. In the Collision dropdown menu select Show Bounding Box so the collision box becomes visible. 5. Adjust he collision by clicking either Calculate Collision (frame) or Calculate Collision (animation). Static objects have a special flag in the wad that enables/disables collision. It also has 2 bounding boxes, visibility and collision. The collision BB is ignored when the flag is set to disable collision. In WADMerger, if you select a static you can click Enable collision to set the flag to enable and Disable collision to set the flag to disable. If setting the flag to enable doesn't work, you need to recalc the collision. If you hold SHIFT when pressing the button the collision is recalculated.